Lip plumpers have been designed to replenish moisture and enhance the natural fullness of your lip, however, there are very few manufacturers that get this formula right and deliver measurable results to their consumers. In this review of Cheeky Physique Sublime Lips, we will be taking a closer look at these aspects to see if this formula is able to deliver on its claims. The product advertises that it will condition and soften the lip while enhancing the fullness and leave your lips with a more definition. 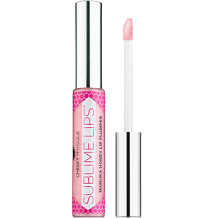 The product can be used alone for a natural shine or along with your favorite lip color. Jojoba Oil is great for moisturizing and healing chapped lips. Manuka honey is said to soften and condition the lips. Hyaluronic acid and tripeptide-1 play a role in hydration and smoothing fine lines. While these few ingredients may seem somewhat beneficial, it’s concerning that this formula does not contain any patented or clinically proven ingredients. There are ingredients such as WIllow herb Flower, Peppermint oil and Pink Purslane which help to even skin tone, boost the elasticity of the skin and increase hydration that seems to be lacking from this formulation. Cheeky Physique recommends using this product whenever you feel you need some added moisture. The product will tingle after a few minutes. The manufacturer claims that continued use of this product over a period of 30 days should be sufficient enough before seeing the full results. A 10ml bottle retails for $25 online and can be purchased directly from the manufacturer. The price is fairly reasonable however, it’s always better if a manufacturer offers discounts or bulk purchase deals especially if the product needs to be used over long period of time in order to see results, which is not the case here. Cheeky Physique offers a 60-day money back guarantee on its products. The product can be returned for a full refund even if it has been used already provided that you get an RMA first. It’s always a good thing to see in a brand when manufacturers offer consumers a risk-free purchase such as this. From what we could see from this brand, there are a few positive factors worth mentioning. The manufacturer offers a strong money back guarantee and we like the fact that the product is readily available at a reasonable price. The negative side of this product is that the formula lacks vital ingredients that could deliver effective results, it’s always better to look for products that include patented ingredients in their formula as they have been clinically proven to work. Another downside is that there are no bulk purchase options available which may land up being more costly for the consumer over time. Some consumers who have tried this product have mentioned that while it did hydrate the lips, it did not make them any different visually meaning that it did not deliver any plumping effect. Based on our findings, it may be better to look for brands that contain a well-rounded formula and offer bulk deals on their products to save you money in the long run.